Want to let you guys know of something pretty *** cool I got recently. My dear friend Brett Barry (on the Café: SAYSOLD1) and I have been friends and consulting buddies for years and now he has launched a game changer in the world of mentalism! As a mentalist and hypnotist I have spent the last year with all my effort and energy towards hypnotherapy. Honestly, nothing in the mentalism world has intrigued me enough to really get back into menatlism, until now! These SvenPads are such an amazing utility device! We have all made our own, or some version in the past. Granted, even going to art school didn’t make mine look much cleaner, sadly. But honestly guys, these things are as clean as they get! They are laser cut 50 page pads. My prediction is these will be a game changer for the mentalism world. Although the concept has been around for a long, long time, these are THE best version I have ever seen. If you haven’t seen this type of device before, here is a clip of Oz Pearlman using this style of device on AGT. These are just some of the quotes coming in! "For many years I've been helping develop original routines for our mentalism students here at Mystery School. Now thanks to Brett's SvenPads, we have a very practical addition to our tool kit! I've used this principle in past performances, but the new SvenPads are the best I've ever seen. They are a joy to work with." "Ok well I just got mine, and upon cursory examination ... EXCELLENT! These are precision cut, very well camouflaged as you can barely see the shorts even when looking for them, and they work perfectly. My days of cutting long as shorts in pads are over. Now that I have seen them, I will be ordering more of them. This is the type of tool that we dream about guys. If you haven't, run don't walk, and get yourself some of these." "Got mine today. I will never make my own again! These are awesome!!! Wow!" "I bought 4 of them! Was years I was looking for something like this, I have done myself in the past and was a pain to do it, thank you Brett Barry for making them!" "I bought 6 of them and I am looking forward to using them in my new show I am developing. Congrats on your release Brett, I believe it will be a big hit!" "One of the most versatile and well made utility devices I have ever used. Highly recommended." "Got my pads, this morning, beautiful quality. I think you've got a hit on your hands, here Brett! Hope the manufacturing process will be up to the demand!" "The SvenPad looks completely innocent and is fully customizable. It is so well crafted that the method is invisible. Definitely going in my walk around bag!" The SvenPad Supreme represents a working Mentalist’s dream. Welcome to the highest quality Svengali pad EVER created – professionally cut with laser precision! The SvenPad looks like an ordinary memo pad from your favorite office supply store – but working Mentalists & Magicians realize what a powerful tool the new SvenPad represents. Then openly hand the SvenPad to a spectator to secretly peek at just one item. The performer instantly knows exactly what she is thinking. How about a “tossed out” SvenPad routine with multiple spectators – each with their own pad? At the end of the show they can talk too – since there are none of the usual limitations with a TOD. Multiple SvenPads will allow you to create a multitude of possibilities with a variety of spectators! The SvenPad is a UTILITY PROP. Most pros and hobbyists are already familiar with a multitude of ways that they could use this powerful tool. Anyone ordering will also receive a copy of Bob Cassidy’s “Scary Movie” routine that has been re-worked for combining with the SvenPad. The SvenPad is easy to carry yet plays big either one-on-one or for stage. The multitude of effects possible with the SvenPad are endless. This innocent little SvenPad is destined to become one of your favorite mind reading utility props! The SvenPad comes in the most popular smaller pocket size (5.5 x 4.25′) or stage sized (8.5 x 5.5) versions. The pocket size easily fits in a sport jacket breast pocket (or a pant back pocket). Each pad has 50 Pages total (25 and 25) + the glossy card covers front and back. I'll be watching this thread with considerable interest. I have in my time used the idea several times, most recently for Bob Cassidy's great effect from The Artful Mentalism II, with great success. It's extremely rare that I buy effects or utility devices, and it's even more rare that I mention or recommend something on the forums. Brett is a dear friend whom I have known for several years, but I would never have done him and everyone else the disservice to talk enthusiastically about his product if it did not deserve it. However, these pads deserve all possible praise. They are priced sensibly, they look innocent, - like a regular pad, and there would be no reason to complain about the quality. In addition, Brett's service is super fast, it did not take many days from I ordered them until they were delivered here in Norway, all the way from Arizona. If you are looking for a utily device you successfully can use in a wide variety of interesting effects, you should definitely consider The SvenPad. "Keep it as simple as possible, - but no simpler"
I am going to be looking for your order especially my friend! Thanks for your support. This would work great with MM's ATM or other effects that you may be fond of. Thank you Sven for the kind words and I hope you love your SvenPads - and look forward to seeing you in Oslo this Summer! I also want to extend my thanks to the many pros all over the world this past week who already bought my new SvenPad Supreme pads and have been saying this met a need as a precision crafted yet innocent utility device. Thanks as well to Jeff McBride for his encouragement, and to Max Maven and Jheff for helping me provide extensive crediting and sound advice along the way. Also a huge thank you to my friend Craig at ProMystic who first suggested some time ago that I consider making these in quantity for all of you (I made the initial batch just for our use and they far exceeded expectations). Even more thanks to our own MasterMindreader and my mentor Bob Cassidy... who generously allowed me to include and revise one of his beloved routines that will be included for all purchasers. I also want thank Oz Pearlman for generously offering to allow me to link to his incredible recent AGT performance which used his own prop. I am proud and honored that he also ordered a set! There is so much that you guys can do with this utility prop! Yes you could make these yourself. Many of you will - and I did for years too. But the quality of these SvenPads I think will save many hours of time and provide you with the kind of organic utility device that will allow you to customize & make these on the fly for an upcoming corporate gig or a special show. The initial release of the SvenPad Supreme was exclusively for the ProMystic Facebook group last week and the response has been gratifying to say the least. CONGRATULATIONS, BRETT! A very fine product truly deserving of a nomination of Trick of the Year! How many magicians does it take to change a lightbulb? Regardless, for magicians darkness is a time for d'lite. Thank you! The response to the SvenPad so far has been nothing short of amazing. Many of you know that I'm a giver by nature. Over many years here at the Café I've touted innumerable effects by many others that I've tried and recommended passionately. When people needed some help or advice on a release- I've gone out of my way to do so. This is really my first release and it was driven by a desire to SHARE with all of you something that I originally had manufactured in a very small batch just for my good friend and colleague Craig Filicetti. Let me also say that the name of the SvenPad reflects what it is. It's meaningful to performers who know that this principle not only goes back to the TV Magic cards we all owned as kids - but Svengali is actually hundreds of years old and dates to the "Blow Books." Interestingly these books are considered some of the oldest concepts in ALL of magic history. The crediting and detailed history are outlined on both my web site and in the lengthy instructions and Bob Cassidy routine that each purchaser receives. I know in my heart that so many of you will be delighted with these. It's a simple yet elegant and well made utility prop - nothing fancy. For those that feel that I've revealed too much - I disagree. People need to know what they are getting and the Sven principle is well known but in many respects under-used. The name tells you what it does - and man does it do it well. Just as my dear friend John Sheets called his amazing creation the "Quantum Bender" - the name tells you what the product does. Did John's name give too much away by using the word "Bender" in it? I think not and I simply refuse to debate this. I've run this idea by some of the biggest names in magic and mentalism. Bottom line is that I saw there was a need for something of this calibre and quality. Nothing like it is currently available. But If you don't like it - if you don't need it - if you feel it's too pricey - if you'd rather spend an hour+ making your own.... Then please don't buy my new SvenPads! But if you've been waiting for something like this - a way of for**ing just about anything so cleanly and invisibly that can be carried in your pocket - then grab a set. I will not be distributing these to dealers and they will only be available through me at my site. Starting in January a quantity of pads will be exclusively available at Jeff McBride's Mystery School for his students. 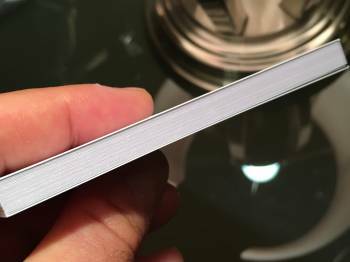 If anyone has questions about the thickness of the paper, what kind of pens to use etc there is a detailed f.a.q. on my web site or you are welcome to email me. Thank you to all who have helped me over the years here at the Café and hopefully with this release I can give something back as a contribution to all of you. Are these not the same as Paul Brooks and Colin McLeod's book No Way Out? A sven pad used for mind reading? As someone who often uses multiple forcing techniques within a show, I'm always on the lookout for a different approach that is both practical and innocuous. SvenPad scores on both fronts and I already have an application that beats any of the other options I was considering. They are easy to setup, easy to use, and look like they will withstand a reasonable amount of repeated use. But like anything, you will want to practice your handling so that you can control you participant's actions. This won't require any ancient voodoo, Vulcan, or Jedi-mind tricks, just some basic physical procedure and structure that ensures control. BTW, if you do have advanced voodoo, Vulcan, or Jedi skills, you won't need these. For everyone else, they're a great addition to your tool kit. Just wandering what the difference is between this and No Way Out? Can you answer that Eric? Paul and Colin are credited properly and I have been communicating with both and are well aware of this product. These are not the same and to respect them - probably best not to delve into their effect or methods. These pads might be quite useful however to those that are familiar with their excellent release. The concept goes back to around the year 1450... and Max Maven was very helpful in helping me fill in some of the history and attributions. So this is the same principle only difference is your using a post-it pad? It's not a post-it pad and I will gladly answer any questions if you PM me. Pads of this style were not invented by me or them... the idea goes back a long time. Bob Cassidy's bulldog deck far pre-dates Paul & Colin's outstanding release going to the early 80's. Last response on this subject. Sorry, but I see nothing new here. Just a bound pad instead of a spiral. Similar to Bip book 2.0 Scott Creasey by the look of things ? RNK this is only a perfected pad using the old Sven principle for those wanting it to buy - Brett did release because he found a way to do it, simple as that. It seems you aren't seeing the big picture here and it's sad... do yourself a favor and stay aside when you don't want to bring something valuable to the table. Yes sir and also credited. But with this you can make your own bip any way you want Tarik. It's a well made utility. What's new is the precision quality and you don't need to spend 1-2 hours on an arts and crafts project of uneven results. I've never claimed this to be new. What's new is the quality. Those who have these on their hands know there's a massive difference. I use made my pads within 30 minutes, they work perfectly and no spectator has ever found anything. But I guess if you want to spend $50.00 on something you can easily make then its here for you. So now we are exposing others methods such as Paul creaseys. I noticed my earlier comment was deleted. This entire thread is basically exposure to sell a product. There is no holy grail! The ad on the website is exposure? Strange.